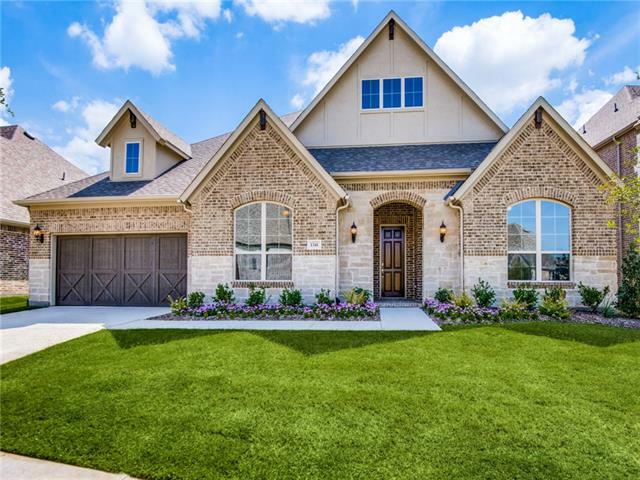 All Lantana homes currently listed for sale in Lantana as of 04/24/2019 are shown below. You can change the search criteria at any time by pressing the 'Change Search' button below. If you have any questions or you would like more information about any Lantana homes for sale or other Lantana real estate, please contact us and one of our knowledgeable Lantana REALTORS® would be pleased to assist you. "Breathtaking New Haven Home for the family that likes to entertain in sought after Laviana. Filled with custom details and luxury features, this home will not disappoint! Commercial grade appliances, dual dishwashers & large pantry makes this the kitchen for all cooks! Formal dining room overlooks the beautiful pool and spa. Grand staircase upon entry into the home will make for great family photos! Be sure to look for the secret room in the office area. 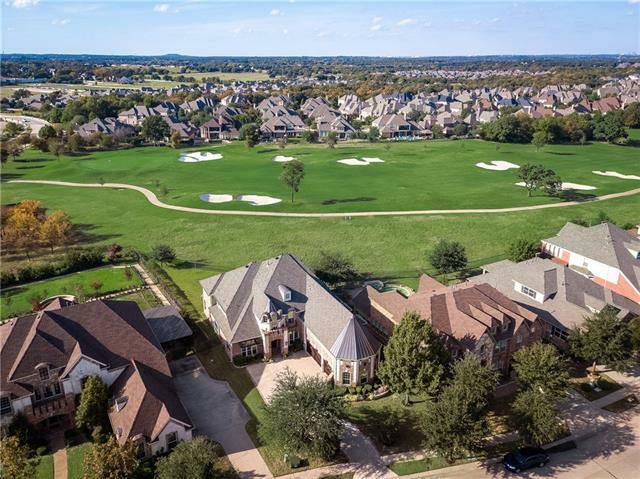 MIL suite downstairs with a private e"
"Majestic views & towering trees surround this gorgeous 5 bedroom Lantana Golf Course home! Open & flowing floor plan offers the best in outdoor living. Tranquil pool with spa, covered patio with outdoor kitchen & multi-level deck adorned with a cozy stone fireplace. Upstairs you will find 3 generously sized bedrooms each with an ensuite, media room & game room with balcony access with a fabulous spiral staircase leading down to the pool area. Downstairs you will find a private guest suite, m"
"53k BELOW TAX APPRAISAL VALUE - Stunning new construction is the best value in Lantana. This French country home offers beautiful finishes with incredible attention to detail. Buyers will admire the Quartzite counters, hand crafted cabinetry & an impressive appliance package make this the kitchen of your dreams. The relaxing master retreat leads to the spa-like bath with convenient access to the laundry room through the master closet. Walls of windows in the grand living room bring the outdoors"
"Stunning 5 BR 5 BA executive Huntington home on over .3 acre corner lot*Lush backyard oasis with gorgeous pool and spa, fireplace, covered patios and outdoor kitchen*retractable shade screens on back patio*Handscraped wood floors throughout 1st floor*Chef's gourmet kitchen with Wolf 6 burner stove, Kitchenaid stainless double ovens and oversized built-in refrigerator*Mother in law suite on first floor with separate bath and hallway*Game Room has built-in microwave, sink and wine fridge*Media Roo"
"All the right spaces in all the right places! 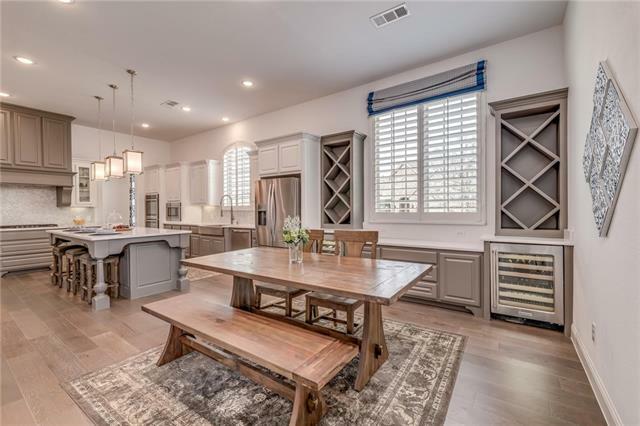 This spectacular barely lived in 5 bed 4 full 2 half ba Highland residence is located in the wonderful resort style community of Reata offering todays neutral pallet and a tone of both warmth & elegance! Beautifully equipped gourmet kitchen opens to the living area w soaring 20ft beamed ceilings & stone corner fireplace. Exceptional floor plan with owners suite & MIL retreat conveniently located on 1st floor easy entertainingflo3w and a spacious game"
"MLS# 14018451 - Built by Highland Homes - Ready Now! ~ Cul-de-sac lot in beautiful Reata! This great 4 bedrm plan with 2 up, 2 down. 1st floor study, a game rm and media up with dry bar and pwdr bath perfect for entertaining. Large Transitional kitchen with lots of cabinets. Upgr Silestone countertops and backsplash, SS appliances, 5 burner cooktop and upgr single bowl sink. Bath 2-down offers shower ILO tub option. This popular D elevation also offers plenty of upgrade features: ext. master be"
"MLS# 14058308 - Built by Highland Homes - August completion! 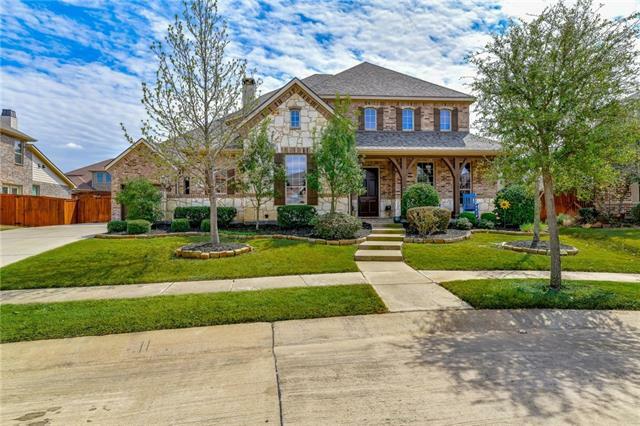 ~ Stunning Two Story Home featuring downstairs Master Bedroom with bay sitting area, bath with lovely freestanding tub, pool bath off the large extended patio, spacious downstairs media room, two bedrooms upstairs with a play room AND game room. This home features luxury throughout with soaring ceilings, wood flooring, spacious gourmet white kitchen with double oven, beautiful silestone counter tops, SS appliances,SS apron front farm "
"Barely lived in Highland Model*Corner Lot*Ample windows allow for abundance of natural light*MEDIA ROOM DOWN*3 car garage w epoxy flooring and access door off the garage*Family Room boasts cathedral ceiling and exposed beams*Open and spacious kitchen adjoins FR and boasts a ss apron sink, quartz counters, double ovens, and 2 wine fridges*Formal Dining Room*Private Study features custom built ins*Beautiful Master Retreat*Guest Room down features herringbone patterned wall* Spacious Game Room boas"
"GORGEOUS Huntington-built executive custom ONE story on premium golf lot! 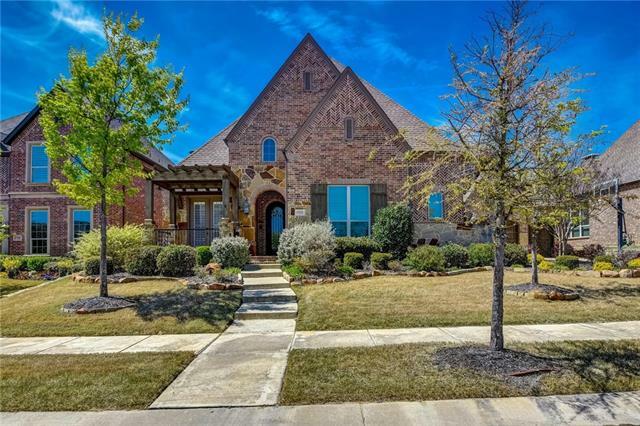 LOADED: Custom beams, custom iron front door, wine closet, media room, ALL bedrooms have private bath, shutters throughout, chopped lueders FP in family, & SO MUCH MORE!!! Rear yard paradise view w- plenty of room for a POOL, outdoor kitchen & more! Privacy & beauty, & the rear faces EAST for shade! 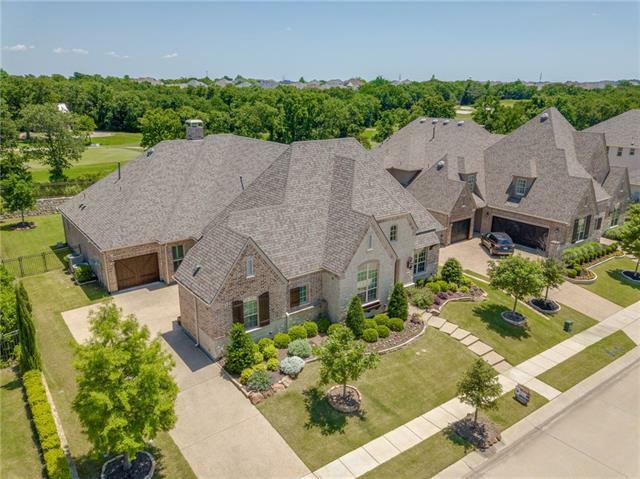 Incredible home for entertaining w- the oversized kitchen, generous cabinet & counter space, built-in fridge, double ovens, 6"
"Gorgeous Lantana home situated on more than a quarter acre has beautiful brick & stone elevation and immaculate landscaping! 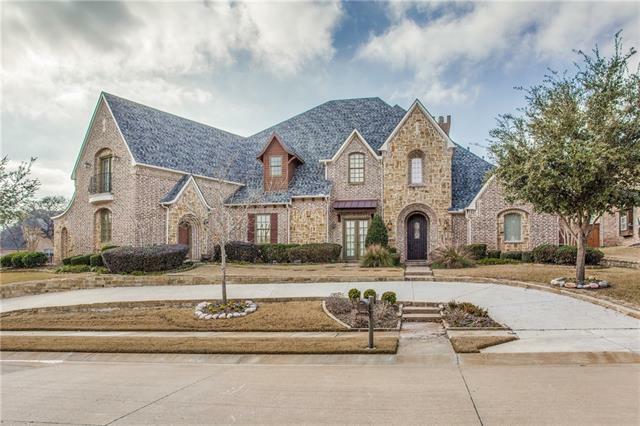 Inside this impeccably styled home you will find 5 bedrooms, 4.5 baths, upstairs game and media rooms, executive study with French doors, and 3-car garage! Beautiful hand-scraped hardwoods flow throughout main living areas. Upgrades include decorative lighting fixtures, plantation shutters, designer paint tones, floor-to-ceiling stone fireplace, & more! Gourmet island kitc"
"Exquisite Highland Home. 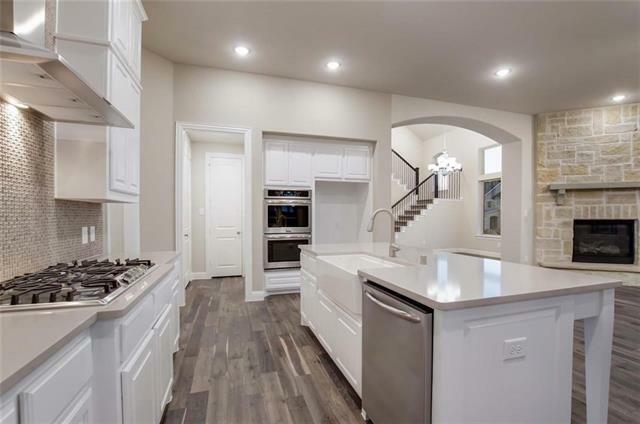 Well appointed kitchen with abundant cabinetry, over-sized island, stainless steel appliances, including double ovens & 5 burner cooktop, quartz counters, custom backsplash, under cabinet lighting & more. Family room with vaulted ceilings & custom beams. 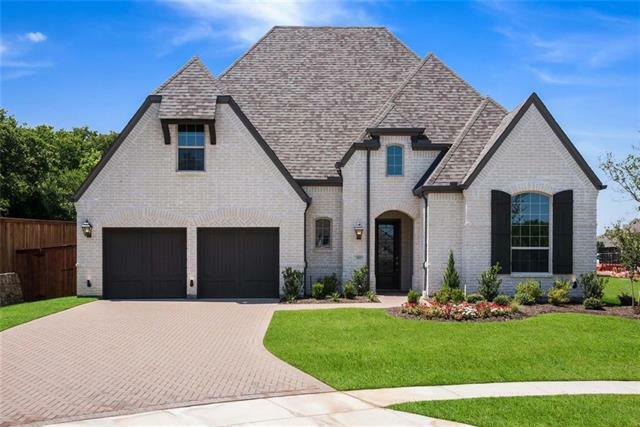 Extended master suite features sitting area, custom closet & luxurious master bath with dual vanities, soaking tub with tile accents & walk-in shower. All secondary bedrooms are en suites. Game room with wet bar and medi"
"Rare 6 Bedroom Gem*Backs to greenbelt*Backyard retreat boasts pool and spa, firepit, and outdoor kitchen and living area*Pool bath with storage*Bonus Green Egg*Putting green*Guest Suite down w full bath*Chef's Kitchen boasts Double Dishwashers, Instant Hot Water, Viking double ovens and pot filler*Private Study is enclosed by french doors w built ins*2 staircases*Media Room features bonus screen and projector*Spacious Master Retreat boasts sitting area*Large master closet w laundry chute* Loaded"
"This gorgeous Lantana home boasts a true Gourmet Chef's Kitchen with a Wolf gas cooktop, built-in refrigerator, pot filler, soapstone countertops, and tons of storage! 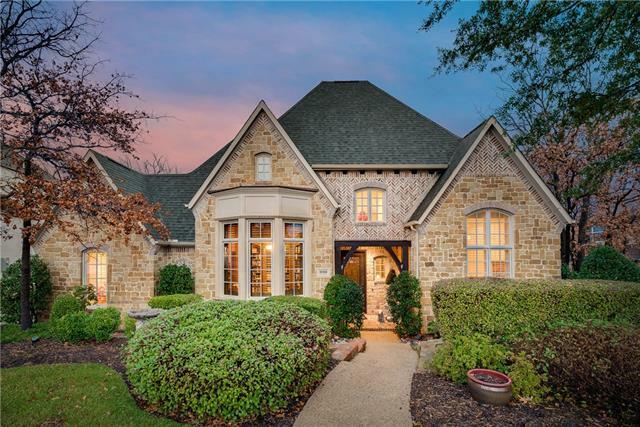 The main level features hardwood floors, large living area with custom fireplace and built-ins, large private office, formal dining room with butler's pantry, master suite, and an additional guest suite with attached bath. The second floor features hardwood floors, 3 ample sized bedrooms, media room, game room, and bar area. The"
"Gorgeous Inside and Out Custom Built Home on 7th hole of Lantana Golf Course!! Embrace Country Club Living with old world architecture. Over 5000 Sf, multi-generational living with 5 bdrm, 5 bath. 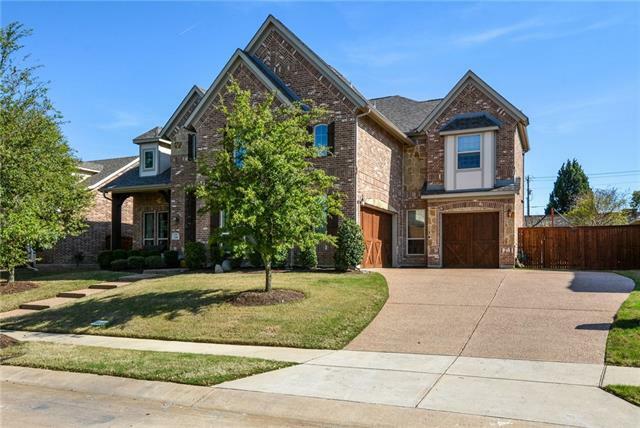 Stunning 18 ft. entrance, vaulted ceilings, hand scraped hardwood floors and granite throughout. 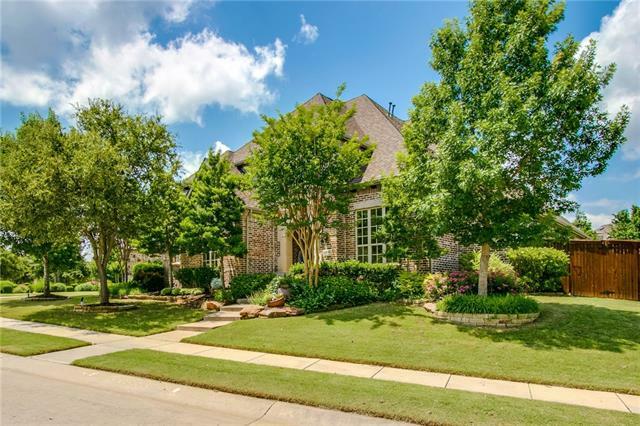 Home boasts Library, office, formal dining, media and full second master with living and bath. Kitchen is a cooks dream with abundance of counter and cabinet space, and 2 pantries. Yard large enough for out"
"MLS# 13954120 - Built by Highland Homes - Ready Now! 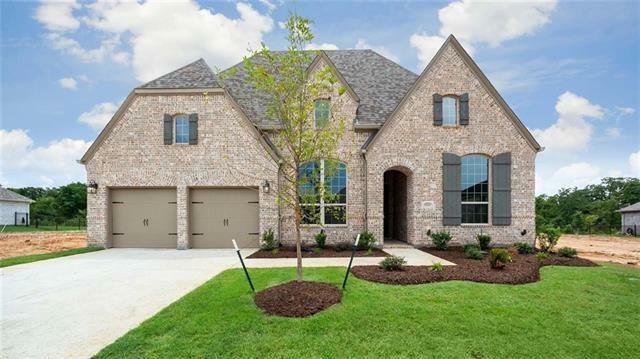 ~ Wonderful large 1 story Highland floor plan! This open concept floor plan offers you plenty of space for family lifestyle living and entertaining. Bonus feature options: master bedroom extension,powder ilo of storage, expanded beds 3 and 4 adding another full bath. Extended outdoor living space, 16 ft garage door, mud bench off garage entry, utility cabinets with sink. 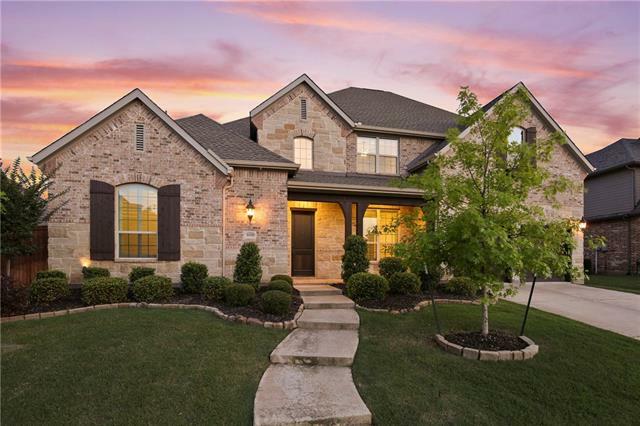 Beautifully appointed upgrades include: SS appliance package with dbl ove"
"MLS# 13874176 - Built by Highland Homes - Ready Now! ~ Awesome 2 story plan with 4 beds down and 1 up. This large open concept will surely fit your living and entertaining needs. The bonus feature on this is a great 4 car tandem garage offering plenty of storage and space. This amazing high impact designed kitchen features white raised panel cabinets, Lvl 2 Silestone tops with a wonderful farm house island sink and upgraded back splash. Additional upgrades include: Lvl 4 Carpet, Lvl 8 engineered"
"STUNNING LANTANA HOME WITH A TOP-NOTCH FINISH-OUT! You will be amazed walking in the front door of this gorgeous home as the extensive hardwood floors & designer colors catch your eye. The amazement continues in the wood beamed ceiling family room overlooked by the gorgeous gourmet kitchen in a great open concept. Easily entertain guests while preparing meals in this expansive island kitchen complete with quartz countertops, double ovens & a gas cooktop. 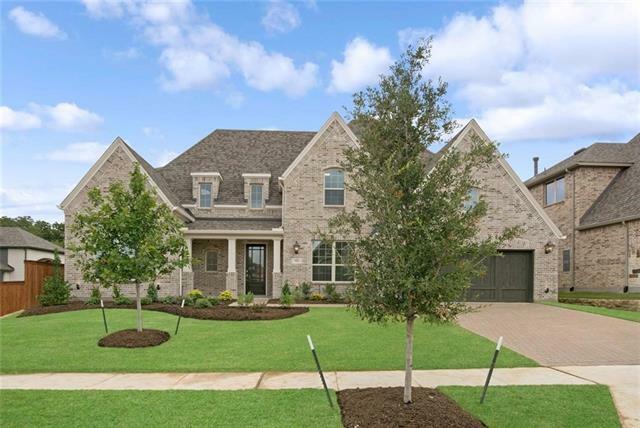 Your master retreat awaits after a long d"
"MLS# 14053917 - Built by Highland Homes - September completion! 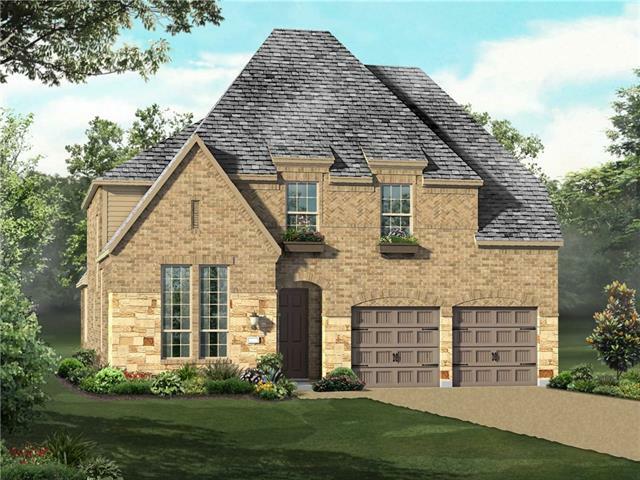 ~ AMAZING GREENBELT LOT for our 1 story Model home plan! 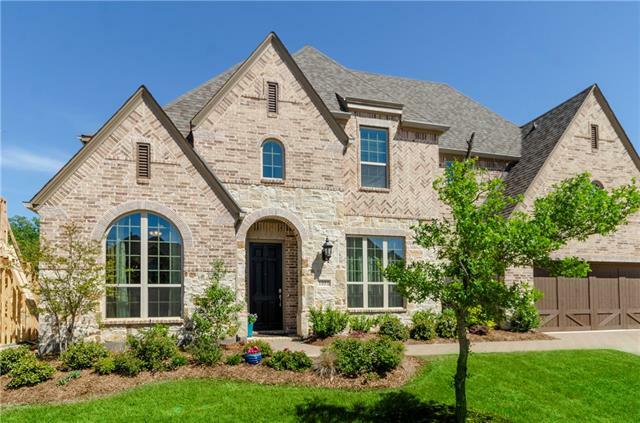 This home boasts 4 beds, 3 full and 1 powder bath, mud room off garage entry, extended master bedroom, extended outdoor living, wine room off formal dining. Beautiful grand stone fireplace. Upgrades include: planning desk, upgraded Silestone tops, SS undermount apron front sink, SS double ovens ,upgraded tile, carpet and engineered wood flooring in high traffic areas." "Stunning home on over-sized lot in a private cul-de-sac. Grand entry features 2-story ceilings, wood flrs and circular staircase. French doors open to office w full wall of built-in cabinets. Formal living can double as formal dining w quick access to kitchen thru butlers pantry. 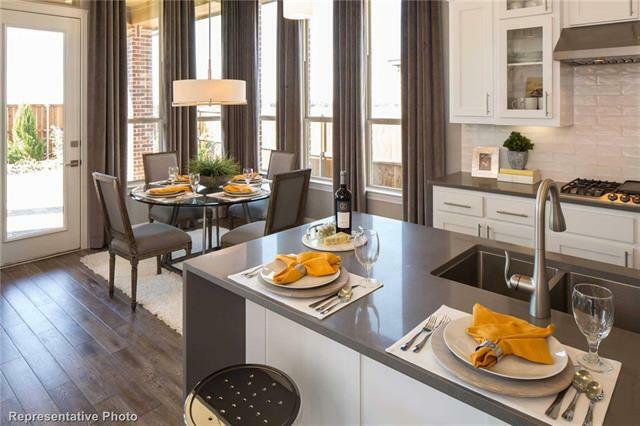 Kitchen features eat-in island, ss appliances, granite counters and breakfast room. Main living is fully open to kitchen w wall of natural light. 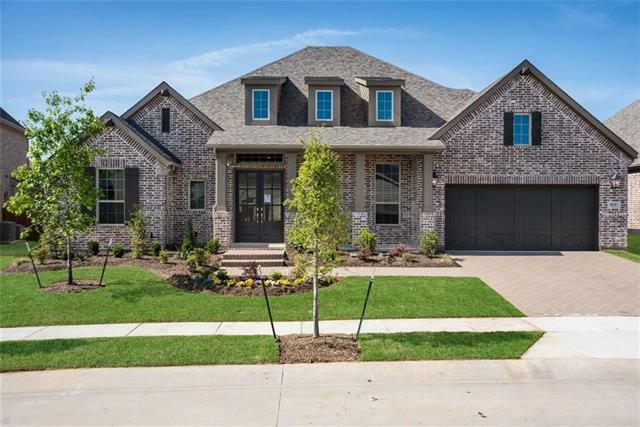 Large master complete w living room, fireplace, en-suite w dual vanities,"
"MLS# 14067527 - Built by Highland Homes - October completion! ~ 3 car wide Garage!!! Large Highland Home with 3 up-2 down. Game room, media room and playroom with computer desk upstairs! Great vaulted family and foyer ceilings. 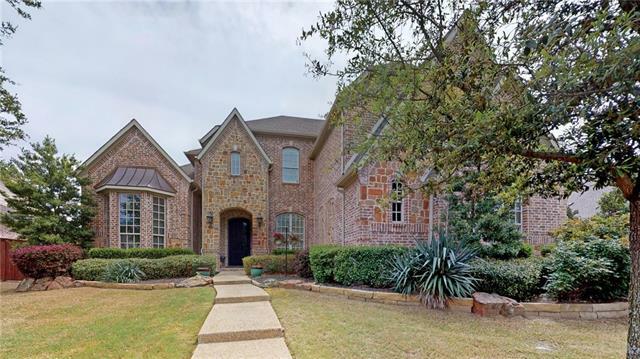 Upgrades include: master bath upgrade option, mud bench off the garage and upgrade kitchen package with SS appliances, SS single basin sink, double ovens,upgraded tops and backsplashes Luxury vinyl flooring in high impact areas and upgraded carpet. 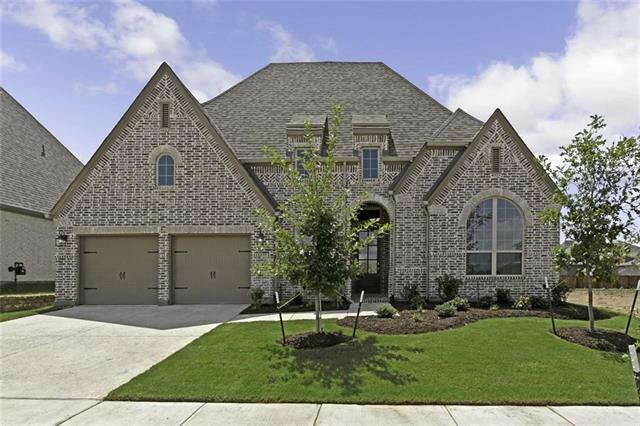 Grand stone corner fi"
"MLS# 14058254 - Built by Highland Homes - September completion! ~ Our popular MODEL floor plan! 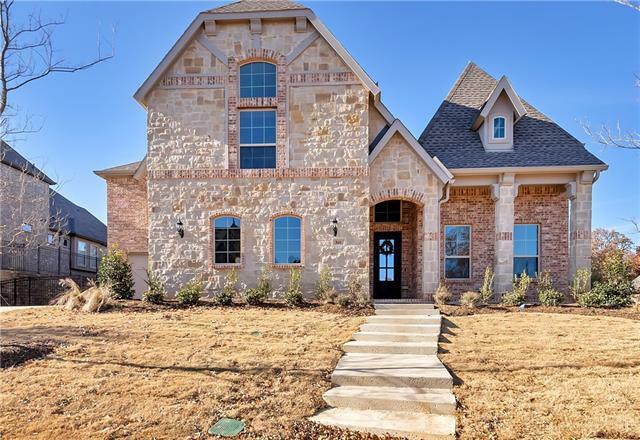 This home boasts 4 beds, 3 full and 1 powder bath, mud room off garage entry, extended master bedroom, extended outdoor living, wine room off formal dining. Beautiful and grand white brick fireplace. Upgrades include: planning desk, upgraded Silestone tops, single basin farm sink, SS double ovens , perimeter cabinets in white with flat panel and island cabinet in pavestone. Awesome enhanced kitchen w"
"MLS# 14053184 - Built by Highland Homes - July completion! ~ If you are looking for a spacious kitchen with a lot of counter tops and upgraded kitchen cabinet package, this home is for you! Kitchen complete with Silestone tops, white apron front under mount farm sink and high impact backsplash. Beautiful master bedroom with separate vanities, Silestone tops, upgrade tiles and large garden tub. Extensive wood flooring and barn doors at the entertainment room entrance. Enjoy your extended outdoor"
"Our super sized contemporary 1 story home is located in Reata, Lantana. All 4 beds & 4 full baths are perfectly separate for privacy with plenty of space for your family! 3 out out of 4 bedrooms have attached bath. The upscale chef style kitchen has an abundance of cabinetry with huge island & Kitchen Aid double ovens. A wine grotto adds the frosting on the cake! The gameroom is pre wired for 5.1 surround sound & ready for parties! Addional interior & exterior lighting. The master bath boasts a "